Priory Maze and Gardens01263 822986work GardenThe gardens are unique in a number of ways - They are on the east coast facing North, with nothing between the gardens and the north pole, yet it has a micro-climate not dissimilar to that of South West Cornwall. 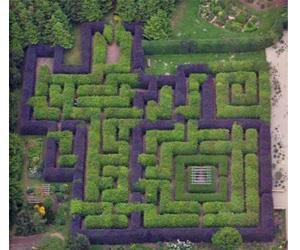 It has the only traditional hedge maze in Norfolk. It has naturally running water on a sandy soil site. It is a true 21st century garden that has been carved out of mature woodland and meadow. The range of plants that can be grown in the gardens represent native plants from many more exotic locations from around the world. The gardens boast several exotic trees of more than 100 years old that have been planted during 2006, and which include olives, needle palms and pomegranates. The gardens have a delightful informal atmosphere of natural maturity and plantings in a very natural form of wide sweeping drifts of colour and texture. The several small lakes and ponds and numerous small waterfalls provide a habitat for an abundance of insects and other wildlife and offers that quintessential element of any garden. The wild flower meadow and surrounding plantings supported 5 types of orchid during the early summer of 2007. Come and be inspired by the Romantic Garden, which features many tree ferns and large blousy plants, which give an Edenesque feel. The most recent large gardens to be added are the Meadow Stream Garden and the Winter Woodland Walk. The Meadow Stream Garden is quickly becoming a must garden to visit with its dramatic changes of seasonal colour and the Winter Woodland Walk has helped to extend the seasonal interest throughout the year. The gardens are provided with an impressive back drop of the 13th century ruins of Beeston Priory, and the natural beauty of the Beeston Bump cliffs. The gardens are open all year round, just closing on Mondays and Tuesdays in November, January and February. Foxgloves tearooms offer hot meals and snacks throughout the day, and the tea gardens add to the delightful atmosphere on warm sunny days. The plant centre offers most of the plants in the gardens, along with a wide and diverse range of unusual plants from around the world. The gardens are unique in a number of ways - They are on the east coast facing North, with nothing between the gardens and the north pole, yet it has a micro-climate not dissimilar to that of South West Cornwall. It has the only traditional hedge maze in Norfolk. It has naturally running water on a sandy soil site. It is a true 21st century garden that has been carved out of mature woodland and meadow. The range of plants that can be grown in the gardens represent native plants from many more exotic locations from around the world. The gardens boast several exotic trees of more than 100 years old that have been planted during 2006, and which include olives, needle palms and pomegranates. The gardens have a delightful informal atmosphere of natural maturity and plantings in a very natural form of wide sweeping drifts of colour and texture. The several small lakes and ponds and numerous small waterfalls provide a habitat for an abundance of insects and other wildlife and offers that quintessential element of any garden. The wild flower meadow and surrounding plantings supported 5 types of orchid during the early summer of 2007. Come and be inspired by the Romantic Garden, which features many tree ferns and large blousy plants, which give an Edenesque feel. The most recent large gardens to be added are the Meadow Stream Garden and the Winter Woodland Walk. The Meadow Stream Garden is quickly becoming a must garden to visit with its dramatic changes of seasonal colour and the Winter Woodland Walk has helped to extend the seasonal interest throughout the year. The gardens are provided with an impressive back drop of the 13th century ruins of Beeston Priory, and the natural beauty of the Beeston Bump cliffs. The gardens are open all year round, just closing on Mondays and Tuesdays in November, January and February. Foxgloves tearooms offer hot meals and snacks throughout the day, and the tea gardens add to the delightful atmosphere on warm sunny days. The plant centre offers most of the plants in the gardens, along with a wide and diverse range of unusual plants from around the world. Our hedge maze and quiz packs provides entertainment for all the family. Coach parties are welcome, though it is advisable to book in advance for catering during the lunchtime periods and busy times of the year and to ensure sufficient room to park. Guided tours are available by prior arrangement. We are one of the few gardens in the country, who welcome well behaved dogs on short leads - they are permitted everywhere except in the tearooms. For more details, please contact our website www.priorymazegardens.co.uk or contact the gardens direct on 01263 822986 or Foxgloves tearooms direct on 01263 822993. Coach parties accepted by arrangement. April to October everyday 10am - 5pm. Take A1082 (signed Sheringham) to roundabout. Turn right onto A149. Priory Maze is 1 mile on left as you enter Beeston Regis.